Acquired by the family of the present owner, circa 1940. Y. Farinaux-Le Sidaner, Le Sidaner, L'oeuvre peint et gravé, Paris, 1989, p. 133, no. 304 (illustrated). Venice, XI Biennale, April-October 1914, no. 809. "There is indeed a fraternity between autumn and the twilight. Man will never exhaust the colour, the splendor, the sadness, and the prefigurations of death and resurrection present at this season and this time of day. Well-trained eyes recognize the richness of this late hour, but know only a little of it. A protracted intimacy, much attention and love, and fortunate opportunities are required. I think also, that silence is needed" (A. Bazin, quoted in op. cit., 1989, p. 133). Le Sidaner was a frequent traveler, always in search of new motifs and vistas to paint. The present work was painted on such a journey, while the artist was visiting the town of Delft. 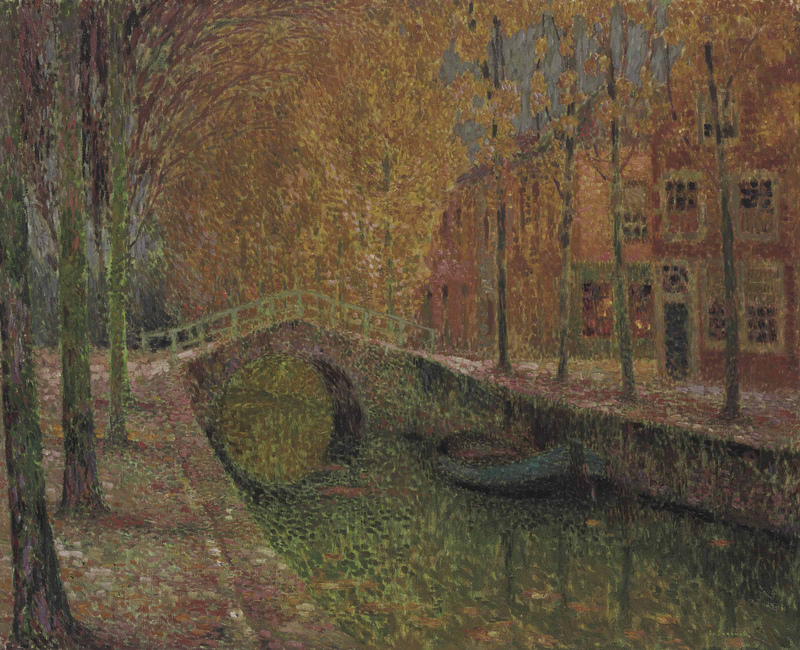 Captured at the moody twilight hour the artist so loved, Le Sidaner emphasizes the deep oranges of the changing leaves on the trees, while giving a silent presence to the blue boat on the still canal waters, executed with staccato brush strokes. In fact, the only sense of human presence and movement we get is through the warm glow of light that emanates from the distant shop window. There exists a small oil study that Le Sidaner painted of the same setting (fig. 1; sold, Christie's, London, 5 February 2008, lot 205). Painted at a much earlier time of day, one can see the stylized modifications Le Sidaner undertook to evoke the coming twilight as seen in the present work, most notably in the articulated brush strokes that make up the trees and water. The present work has remained in the same family, with its location unknown to experts, since its acquisition in the 1950s. Residing in Asker, Norway at the time, it is unclear where the Naess family acquired the work, though it has remained family lore that various members of the family could have had an equal hand in acquiring it--whether it was the local politician who was also a member of the town art council or through Norwegian artists such as Gustave Wentzel and Jo Vistal who were counted as very close friends with the Naess household, its origins in the family are not known. Nonetheless, the painting has been mounted on the same wall in the salon of the family residence in Asker ever since (fig. 2). It was last held by Grete and Oystein Naess. It was on their passing in 2010 that the family estate decided to part with it.